I can’t think of a better evening than an enjoyable dinner, while listening to toe-tapping music? 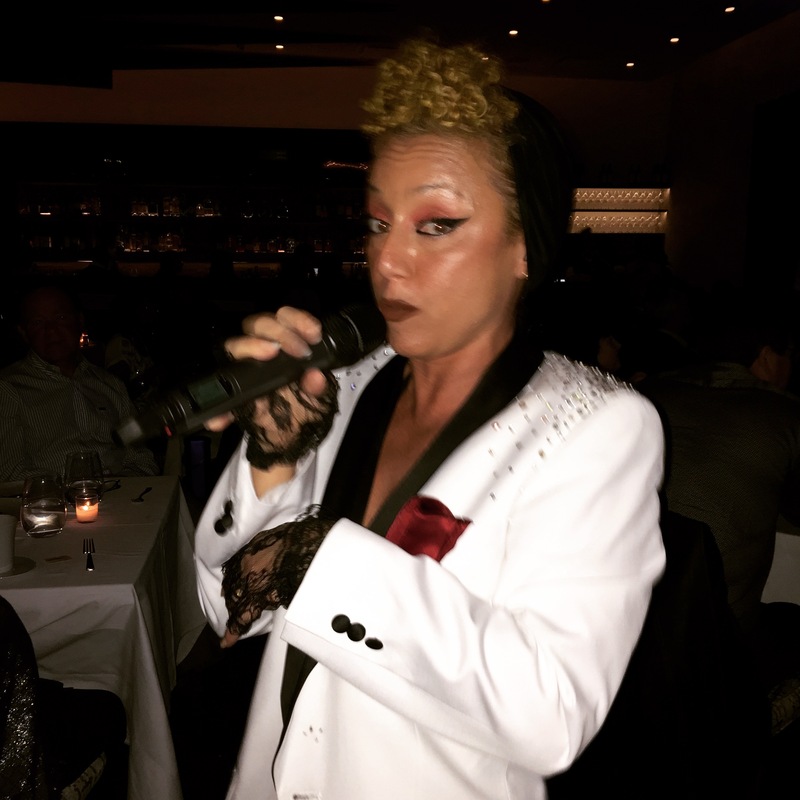 Learning that the new Spaghettini and the Dave Koz Lounge opened in Beverly Hills, my husband and I made a reservation for dinner on a Friday night and to enjoy the Neo-Ragtime sounds of the mega-talented Dessy Di Lauro. The sophisticated supper club is the second dining and entertainment destination by restaurateurs Cary Hardwick and Laurie Sisneros. They also own Spaghettini in Seal Beach. With their 26 years of success in Orange County, they united with renowned Grammy nominated saxophonist Dave Koz, to create a top-notch restaurant offering refined California-inspired Italian cuisine in a state-of-the-art music venue. Platinum-selling artist Dave Koz has played with Burt Bacharach, Ray Charles, Natalie Cole, Celine Dion, Kenny Loggins, U2, Barry Manilow, Luther Vandross and Rod Stewart. He is a humanitarian, entrepreneur, radio host, and instrumental music advocate. The trio hired Eric Rosen Architects to build an open room restaurant and live music venue with exposed wood beam ceiling, leather booths, white tablecloths and porcelain serving plates. The owners hired an extremely personable staff that are informative and cheerful with each other and the guests. It creates an upbeat, team serving dining experience for all. They also lured Executive chef Scott Howard from Brick & Bottle in San Francisco to serve as the culinary director for both restaurants. Not only does he prepare some of the signature Spaghettini dishes from Seal Beach, such as the Parmesan crusted Chilean Sea Bass, but also creates some new innovative dishes for the discerning OC and LA foodies. With a 7:30 p.m. reservation, we were immediately led to a raised semi-circular booth that was roomy enough for up to four guests and a great viewing spot for the show. Bread and water service arrived while we looked over the menu. 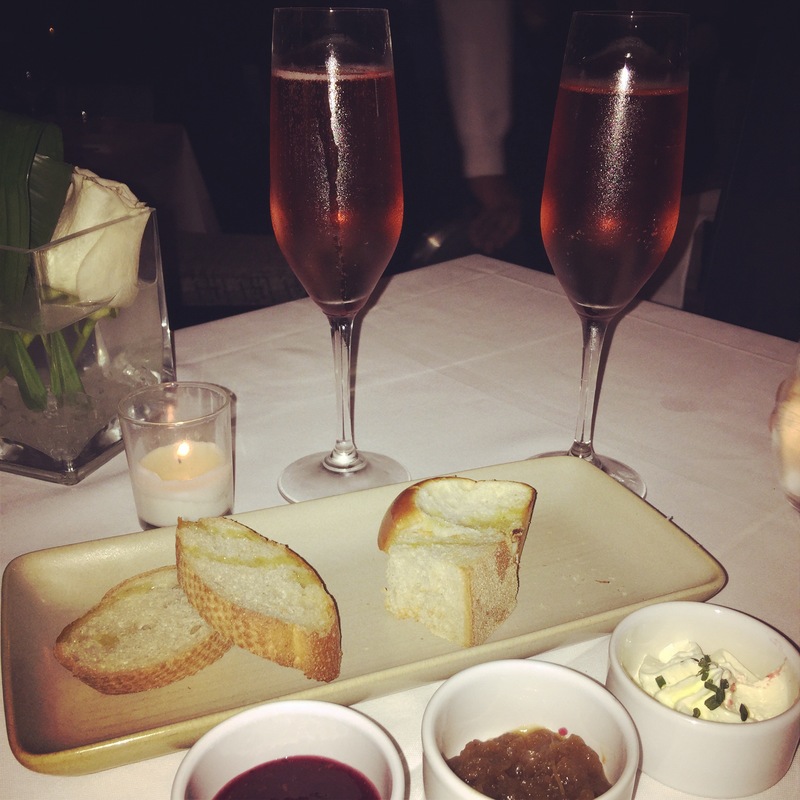 A tray of housemade baguette and toasted Parker House sliced rolls were served with three condiments in small dishes. There was a delightful jam made of strawberry, raspberry and rose water to spread with caramelized onions and unsalted butter, a sweet, yet savory starter. Looking out to the dining room filling up with guests, we noticed some diners received a low stool to place their purse, jacket or scarf, instead of hanging it on the back of their chair or putting it on the floor, exemplifying their high-touch service. Starters on the menu include a creamy, white burrata with strawberry jam and wild rocket arugula; ahi tuna tartare with Yukon chips, and meatballs in creamy polenta. We ordered the Carnaroli medium-grained risotto with an array of mushrooms, a splash of Maderia wine, shaved Parmigiano and Reggiano and chopped chives. The dish was rich, filling and pure comfort food. This could have been my meal with a flute of Nicolas Feuillatte Brut Rose. The sparkling wine is blended from 90% red grapes with a pour of Chardonnay. It’s a vivid pink color with flavors of raspberry, strawberry and red currants. The bubbles offset the creaminess of the risotto. However, we continue by ordering the heirloom apple and arugula salad with frisee dressed with champagne vinaigrette, Pecorino cheese and chopped walnuts. The chef tweaks some of his dishes weekly. I learned that last week, this salad had Point Reyes blue cheese instead of Pecorino cheese. I like the Pecorino, it’s a widely used, sharper alternatives to Parmesan cheeses. It’s hard texture and sharp salty flavor, is excellent grated over pasta and salads. For pasta dishes, the spaghetti arrives with five medium-sized meatballs topped with a slightly sweet, garlic San Marzano tomato sauce. The San Marzano tomatoes are thinner with a thicker flesh and offer a stronger, sweeter and less acidic than other tomatoes for sauces. Chef Howard also prepares a bucatini with cheese and a fiery bucatini with shrimp. His trotolle pasta has a lamb bolognese with feta, and he also makes a spaghettini topped with Dungeness crab, shrimp and Uni butter. For a even more savory dish, Howard’s pappardelle is mixed with short rib sugo and blistered cherry tomatoes. We ordered the restaurant’s signature lightly crusted parmesan Chilean Sea bass served with asparagus and a potato puree seasoned with a pleasing Meyer lemon butter sauce. We paired this with a glass of Dave Koz Chardonnay. It’s a fruit forward wine with grapefruit and golden apple aromas with a hint of vanilla and oaky finish. Koz recently partnered with premium Santa Barbara vintner Terravant, Whole Foods Market and California Pizza Kitchen to introduce a new quartet of KOZ wines—with all proceeds benefitting the Starlight Children’s Foundation and its vital mission. Other entrees include Branzino; salmon with baby artichokes; lamb chops with a cilantro and mint pesto; a pork chop with a maple jus, New York steak with a bordelaise and braised short ribs. Side dishes are available, however most entrees are accompanied with a vegetable. Around 9 p.m. the wood walls in the center towards the back of the room slide to the side, as musicians walk onto the stage to warm up and check out the crowd. There really isn’t a bad seat in the house. The show starts around 9:15 p.m., right as you order coffee and a dessert. Your show tickets will be added to your bill at the end of the evening. If you are interested in the live music only, there is a cover charge and a two drink minimum per person. Seating is first come first served. Check in with the hostess when you arrive to be placed on the waiting list. Seating for the show begins around 8:45 p.m.
For ninety-minutes the stunning Dessy Di Lauro was backed by her stellar seven-piece band with a horn section, and two talented tap dancers. Her musical director/pianist Ric’key Pageot played on keyboard and accordion. Special guest saxophonist, composer, producer, and vocalist, Eric Darius, joined Dessy onstage, as did rapper Anon. Spaghettini & the Dave Koz Lounge is now offering a power lunch every Tuesday through Friday from 11:30 a.m. to 2 p.m., with California starters, salads, sandwiches, pastas, and entrees from the land and sea. The restaurant offers a more casual approach and a sidewalk patio to soak in the sights of Beverly Hills. On Sunday the restaurant serves brunch and jazz from 11 a.m. to 3 p.m., with 94.7 The Wave broadcasting live from inside restaurant and Dave Koz’s protégé Vincent Ingala as the resident musician. Every Tuesday through Friday, Spaghettini offers Social Hour from 5 to 7 p.m. showcasing bar bites with rotating cocktails and select wines by the glass, including Dave Koz’s label. 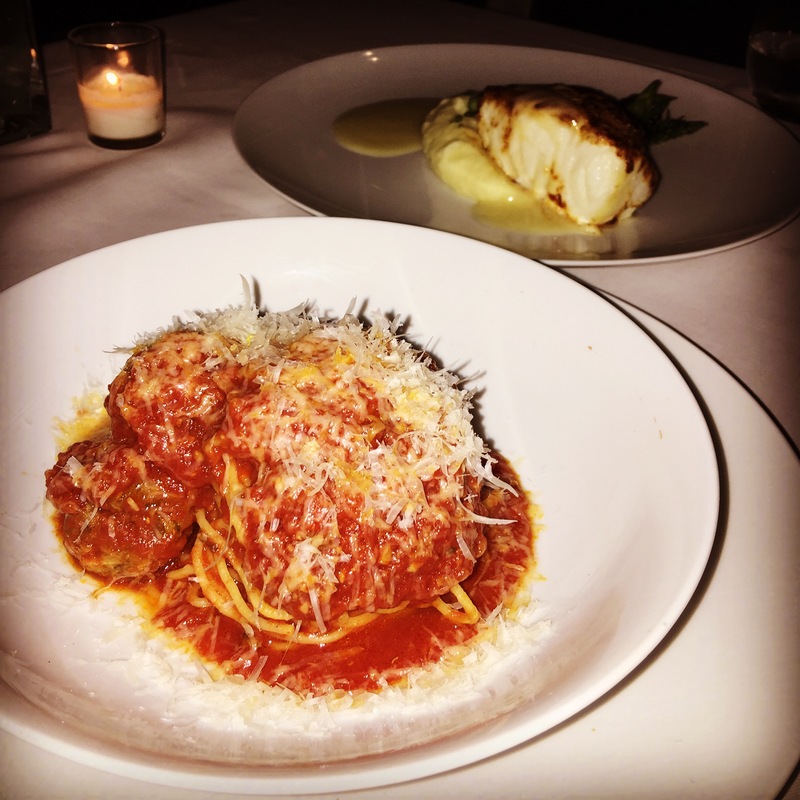 For a throughly enjoyable meal and gratifying live music, make a reservation at Spaghettini and the Dave Koz Lounge. Dinner service begins at 6 p.m. every day, except Sunday when the restaurant serves dinner at 5:30 p.m. $$-$$$ 184 N. Canon Drive (310)424-4600. This was published in the March 12, 2015 issue of the Park LaBrea News and the Beverly Press.